Between the availability of auction format listings and best offer functionality, eBay is a great place for deal-making—these kinds of tools enable much more flexibility to buyers and sellers than do the fixed prices of a marketplace like Amazon.com. But did you know that you can take haggling to the next level for fixed-price listings by easily making offers to buyers that you're already communicating with? If you've encountered any of these circumstances in the past, sending an offer directly to a potential buyer can be a great way to make a deal that might otherwise not have occurred. Locate and click on the link near the bottom of the message text labeled "send an offer directly to the member"
After you follow these steps, your buyer will receive a message that offers them the particular price and quantity that you've committed to, and a link at which they can make the purchase. If your buyer follows through and completes the purchase, it proceeds as would any other eBay purchase—all standard buyer and seller protections and terms apply, as well as the shipping, handling, returns, and other terms you've spelled out in your item listing. Once the transaction is complete, they'll be able to leave feedback and detailed seller ratings for you, just as they would with any other purchase or item listing. When a buyer has taken the time to contact you about an item you've listed for sale, they're not just asking a question via the mail forwarding system, they're also showing that they're interested enough in buying your item that they've taken time out of their day to talk to you about it. 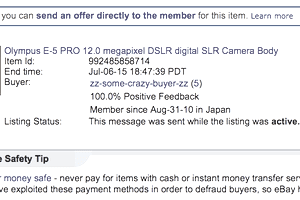 When you receive a question about an item, therefore, don't just take the time to answer it (though you should definitely do at least this)—also check out the buyer's feedback and recent transaction history. If they look like someone you'd like to sell to, don't wait—send them a special offer right away, along with a message telling them that you're making a special offer just for them. Knock a couple of dollars off the price and let them know that only they are getting this price—and be amazed at how often you're able to close the sale right away.